Purchase We're Different, We're the Same Here! incorporate this book into your classroom! 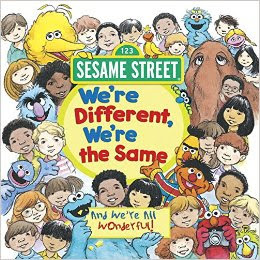 Summary - We're Different, We're the Same is a book about different people, animals, and characters from Sesame Street who have physical differences, but are all the same in their own unique way. The characters in the book are all different shapes, sizes, some tall, some short, with different hair types, skin colors, and feelings however, through illustration we see that though they are different they are all the same in their own way. For example, the books shows that the characters have different noses that are all different shapes and sizes, but they are all the same, "they breathe and sniff and sneeze and whip." After showing the characters differences and similarities, the book goes on to show pictures of the characters in familiar places such the park and the beach utilizing their similarities in different ways. For instance, in the illustration for the noses, you see the characters sniffing flowers, sneezing, smelling different foods, and stinky things. The book is full of very fun and colorful pictures portraying the characters doing different things with their same body parts. The author also rhymes when writing making it really fun for the younger kids to follow along. Element #2 - Respect for Others - We're Different, We're the Same introduces children to all kinds of diversity and teaches respect. This fits right in with Element Two: Respect for Others as it could be perfectly incorporated into the classroom that though we might look different, though we might come from different parts of the world, have different skin colors, we still use those differences in the same matter. Element two encourages respect, love, and acceptance and that's exactly what this book is doing. The illustrations perfectly show all the differences and shows a world were people use those differences to have fun, respect one another, and include anyone no matter how they look on the outside. Element Two goes beyond loving yourself, but also loving your neighbor for who they are and respecting them for that. The characters in the book can clearly be shown celebrating one another and being proud of not only themselves, but of each other looks, talents, and preferences. Classroom Activity - We're Different, We're the Same can be used as an ice breaker in the beginning of the school year so that teachers can already establish a sense of respect for others in their classroom. The book can be read and followed by a class discussion of what makes everyone different but alike at the same time. It can also be a great tool to establish respect and understanding in an inclusive classrooms. The activity that could follow after the class discussion is that each child can take pictures of what makes them different yet the same from their classmates, create a book, and share it with their class. This can be done in several steps, and can also be worked so that eventually the class creates one big book just like Kates' book. The book that the classroom creates can be used year round to be read to any new students that come in the classroom in the middle of the year, to show any visitors, and to be read to on sporadic basis to keep reinstating the fact that it's so important to respect each others differences.